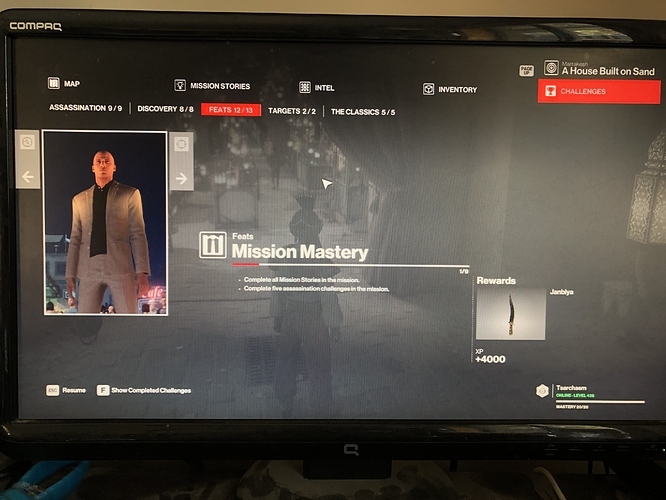 Did you remember seeing a progress bar and a small image popped up on the top right corner of your screen when you completed a challenge/mission story? Did you unlock the achievement “A Golden Opportunity” which is to complete all mission stories on AHBOS? I suggest you to contact IOI employees like @Travis_IOI, they may be able to help you, cheers! Edit: one added question: did you quit the mission and restart after you completed each challenge/mission story? Cause if you don’t enter the result page (where it shows you the challenge you unlock and your rating), it can become quite buggy. Thanks for replying. There was a progress counter after each objective, but it was always showing 1/9 complete. “A golden opportunity” has been unlocked. I may have loaded a couple of times during the sequence, but I was also doing the exit objectives at the same time, so I was completing the mission as I was going along. Hopefully this additional info helps. I see. There is nothing I can help you though. Because in my playthrough, the challenge was unlocked as usual. Anyway, glad to further understand your situation, and don’t forget to contact supports from IOI. I hope your problems will be eventually solved! When it happened to me for Mission stories in Isle of Sgail the solution was to turn on Story Guides and do them again. I actually did The Icon first and had no issues with it. I hope the devs read these forums as lots of people have posted about this so i reckon it needs to be fixed. I didn’t have any disconnection issues (although funnily enough I have had some since then which have since resolved themselves). Same issue happens to me. Same thing just happened to me. Any word on this yet?